Manufacturing companies have a dignified motto of serving people which help them in maintaining and making the daily needs of a life better and more. In a busy place like a cafeteria, it can help in improving people's as well as your workers’ live! In a busy world like today, people tend to prefer readymade foods over self-cooked ones. A cafeteria is an important place to lure out the hunger from people’s minds. So the owner of a cafeteria would be able to serve more people if it had better appliances and manufacturers. Having refrigeration in the kitchen is the starting point of your journey towards excellence. Refrigerating food items prevents them from getting spoiled, maintains their freshness and provides cold food storage space. The manufacturers of cafeteria equipments design the equipments in such a way, that it could be able to meet the unique needs of the cafeteria! Their task is to cut meat, cheese or other food items with a definitive speed and precision. If your slicing work is low or not constant, consider buying the manual slicers ,which are cheaper. But if you have to slice large volumes of items in a short time maintaining the precision, consider buying the electric slicers. These slicers are fully-automated and so absolutely no need for labor! Just like slicers, you get to decide whether you need a mixer or not, the decision is purely based on the volume of food that requires to be processed. If you often have to mix ample amounts of dough for making pizzas in your Cafeteria, having a spiral mixer will be a good investment of money. In your cafeteria, baking stuffs is an integral part as people love baked cakes and cookies and that too freshly made. In a busy and big place like cafeteria, consider buying a convection oven, which has a fan and its own exhaust system to wipe out all the hot air! Shelving provides an ideal solution for storing various ingredients and foods, that too in a hygienic and standard manner. Shelves also give a fine look to your café. Shelves and Racks comes in different shapes and sizes to fit your cafeteria in particular. 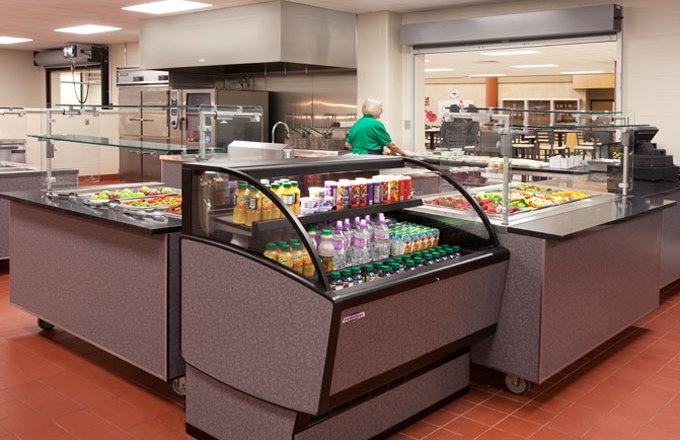 The manufacturers keep in mind that different cafeterias have different needs and demands. The cafeteria appliances have come out to be a great way of serving more in less time. Cafeteria apparatus manufacturer wants to completely revolutionize the serving and cooking procedure in Cafeterias. People can now feel comfortable while preparing raw foods to convert them into an End-product .This can preserve the food as good as freshly cooked food, keeping the balance of proper humidity and moisture. The Cafeteria equipment manufacturer will surely help in supplying the most essential products for your cafeteria, which will help you in boosting the overall hunger-management of the customers there. Cafeteria Equipment Manufacturer understands the peer pressure on your cafeteria workers of serving quality, warm as well as exquisite food to a bunch of Hungry-Angry people in a neat, authentic and time-saving way. They are always on their max to serve people well!